NEW YORK — Target Corp. cut its profit forecast and a key sales outlook Wednesday as it saw fewer customers in its stores and acknowledged it didn't push the second part of its "Expect More, Pay Less" slogan. The Minneapolis-based discounter's second-quarter net income fell nearly 10 percent, though that was better than what most had expected. Sales at stores open at least a year fell 1.1 percent, reversing seven straight quarters of gains. Its main competitor, Wal-Mart Stores Inc., reports results Thursday. Target's shares fell $4.74, or 6 percent, to $70.74 in afternoon trading. Customer traffic fell for the first time in a year and a half as Target struggled to get its grocery offerings right and shoppers looking for deals on essentials like detergent were turned off. Other issues, both company-specific and industrywide, ranged from a lack of new electronics for sale and lingering disruptions caused by the sale last year of its pharmacy business to CVS. Sales by markets also varied, with weakness on the East Coast but pockets of strength in California. "Our No. 1 focus is driving traffic back to our stores and accelerating business to our site," Chief Executive Brian Cornell said. Target joins retailers such as department store chain Macy's that are struggling with fewer customers coming in as shoppers buy more online. The bright spots in retail have been T.J. Maxx's parent company TJX Cos. and Home Depot as consumers look for clothing bargains and focus more on their homes. Under Cornell, Target has been trying to reinvigorate itself restore its cheap-chic status after a series of headline-grabbing setbacks such as a 2013 data breach. It's focusing on categories like fashion, home furnishings and wellness products, creating vignettes featuring home products and launching the children's line Cat & Jack. But striking the right balance between stylish clothing and bedspreads while offering toothpaste and detergent at good prices has been tricky. "Our progress in apparel and home has been really significant," said Cornell. "And we've got to make sure we never lose track of the other side of our brand promise and that's the "Pay Less" side. And that's all about those core household essentials that we have to make sure are presented effectively." To boost sales and traffic, Target plans to increase marketing for its essentials and work with key vendors like Apple to push more innovation and to also improve presentations. Apple product sales were down 20 percent and the electronics department was a "significant drag," Cornell said. Target is still struggling, however, to reinvent its food section — an area where Wal-Mart is particularly strong. Grocery sales represent about 20 percent of Target's total business but it has seen disappointing results from perishables like fruits and vegetables. Its nonperishable items have been doing well, and it's marketing more organic, natural or gluten-free products. Yarbrough noted that Target faces stiff competition on the low end from Wal-Mart, which is focusing on lowering prices further, and at the high end from the likes of stores like Whole Foods and others. "Grocery is going to be more difficult to fix," said Brian P. Yarbrough, a senior analyst at the Edward Jones investment firm, which downgraded Target's stock to "hold" from a "buy" rating Wednesday. "They're not a destination for food. They don't offer a whole suite of products." While nowhere near the online volume of Amazon, Target is expanding its online services. It's doubling the number of stores that will be used to ship products directly to online shoppers' homes, which will result in speedier deliveries. Online sales rose 16 percent in the second quarter, lower than the 23 percent gain in the first quarter. Target also is spending to modify some stores after an outcry from some customers about its policy of allowing transgender customers and staff to use the bathrooms that identifies with their gender identity. Chief financial officer Cathy Smith said the backlash hasn't had a "material" impact on sales, but some customers are still upset. "We are listening to our guests," she said. 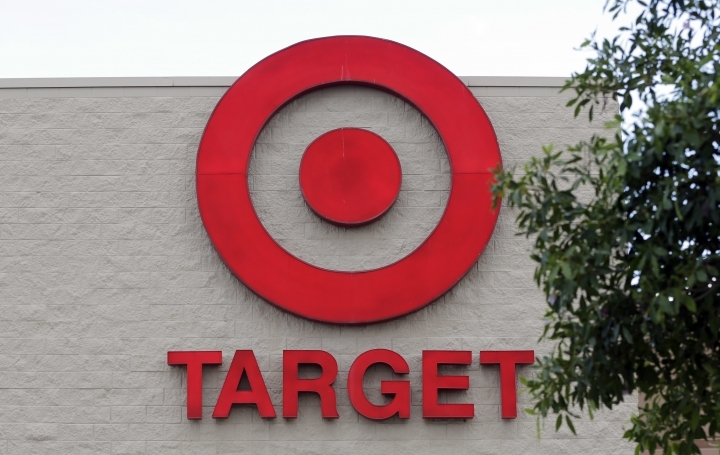 Target is investing $20 million in building single-stall bathrooms in stores. Target reported net income for the quarter of $680 million, or $1.16 per share. That compares with $753 million, or $1.18 per share, a year earlier. Adjusted per-share earnings were $1.23, beating projections of $1.14 from Wall Street, according to a survey by Zacks Investment Research. Revenue fell 7 percent to $16.2 billion. The company now expects earnings this year from $4.80 to $5.20 per share, lower than the $5.20 to $5.40 it had projected earlier. Same-stores sales could fall as much as 2 percent in the second half of the year, Target said.